I’ve been trying to plan a date for our yearly trip down to the mouth of the Grand River for channel catfish. As I’ve mentioned before, timing rivers for a successful trip can be problematic, especially without the luxury of a lot of free time during our busy lives. This year is proving to be no exception to this rule. The winter was a complete bust, with work, family commitments, a marketing course, and lakes that would freeze and immediately thaw just in time for the weekend, I made it out ice fishing a grand total of zero times. Now spring has arrived and heavy rainfalls have made the local rivers not just unfishable, but downright dangerous. Normally we’d have packets of fresh caught sucker cut bait in the freezer ready to go by now but I’ve yet to even wet a line. A may go on a rampage soon… (Dear CSIS / FBI / NSA etc. I am not going on a rampage, this was a joke attesting to my mood after not fishing for 5 months because of El Nino and other factors. Please do not put me on a no-fly list). 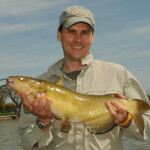 However, with the seasons closed for most sport fish here in southern Ontario, catfish, sucker and carp are really the only game in play. So if I want to get out I better figure out the what, where and how to go about catching them. I did a quick check of the water temperature in the Thames and it was 4C or 39F. Basically still pretty much winter like conditions. Let’s look at what catfish should be up to as the weather (and water) goes from winter-like to spring. Wintering areas for catfish are deep holes away from the current. These holes offer both food and some thermal refuge (remember that in winter warmer water, around 39F (4C), will be found closer to the bottom). In rivers look for hard bends or near steep rip rap banks. The confluence of two channels or rivers may also have deep areas associated with them. The bite will likely be quite slow and may require a long bait soak to entice them (up to hours – provided you’re confident they are present)(1). According to catfish farmers, active spring feeding is generally triggered by temperatures in the mid 60F range and up. In more northern waters, where fish are more accustomed to cold, active feeding for cats can begin at colder water temperatures (55F)(2). Prior to spawning, channel catfish will congregate at creek and stream mouths and other staging points to spawning areas waiting for the temperature to be right. In large rivers blocked by dams, catfish also congregate downstream during pre-spawn, spawn and post-spawn phases. Catfish will stay in these areas for a while picking up food washed over/through the dam. Key in on pockets of slower moving water(3). Channel catfish spawn when water temperatures reach 70 to 84F so it’s likely that spawn is quite a ways off around here, at least late May or June. As the water warms males will select nest sites – usually dark secluded areas in rip rap, rock piles, banks with undercuts, root wads – any good cavity (catfish are cavity nesters). After eggs are laid into the nest the males drive off the females and guard the nest until the fry move off (6-10 days to hatching, a few more days as fry before they leave). Unlike most fish, catfish are generally harder to catch when the spawn is on with males and females being relatively inaccessible during the spawn itself and the males (half the population) tucked away for longer periods guarding nests. That said, during the spawn, rip-rap banks can be good location to try. 1) Winter Catfishing Tactics, Game and Fish, December 15, 2010. 2) H. Schramm, Spring Catfish Spawn Connection, In-Fisherman, April 21, 2014. 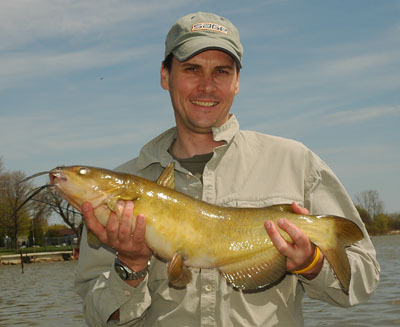 3) K. Sutton, Understanding Catfish Spawning, Game and Fish, June 6, 2006.